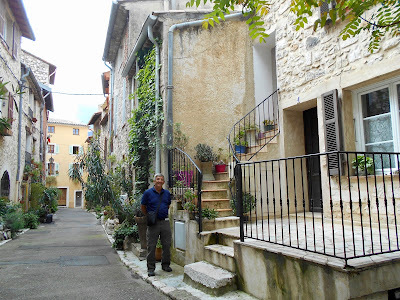 If you missed Vence: Part 1 click HERE, otherwise read on. 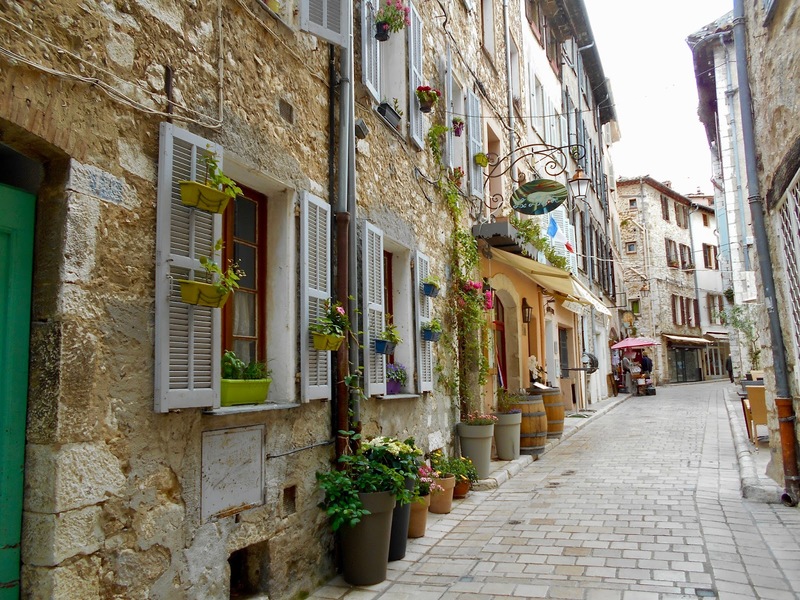 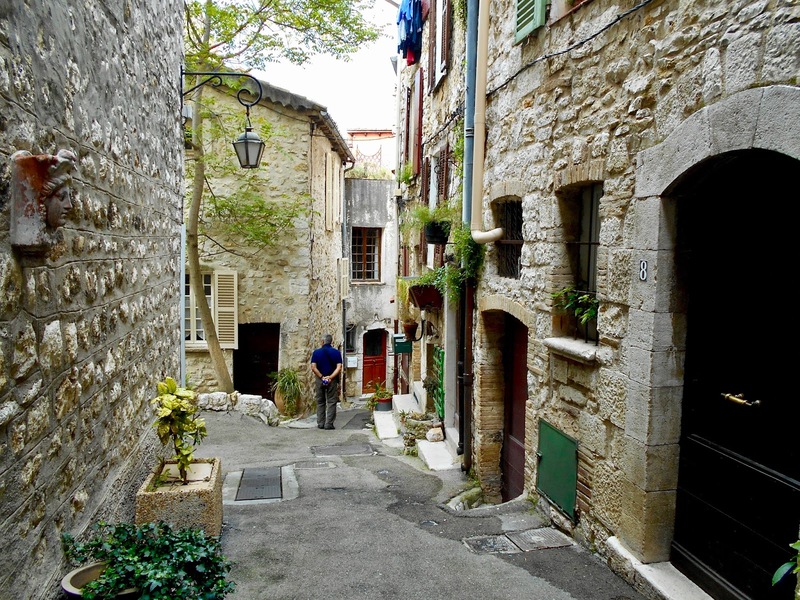 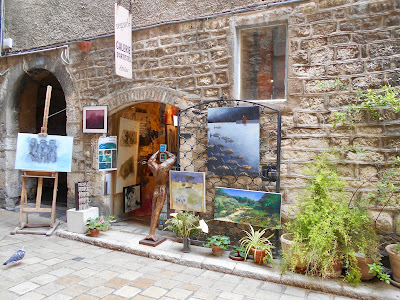 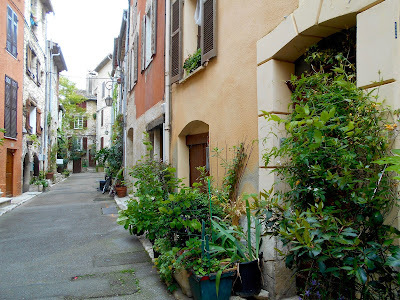 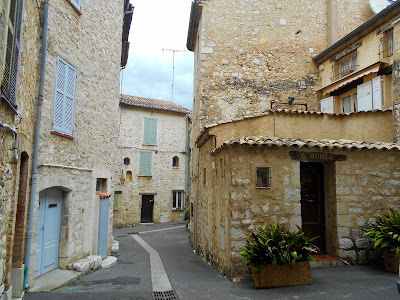 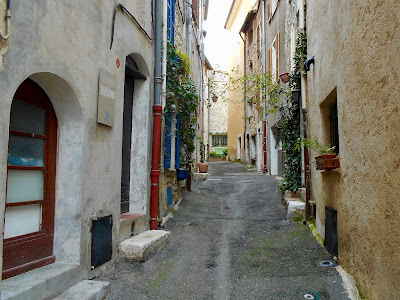 Besides the gorgeous old buildings, fascinating shops and art galleries as well as the many delightful restaurants with outdoor seating, the primary appeal of medieval villages for me is the pedestrian only alleyways. 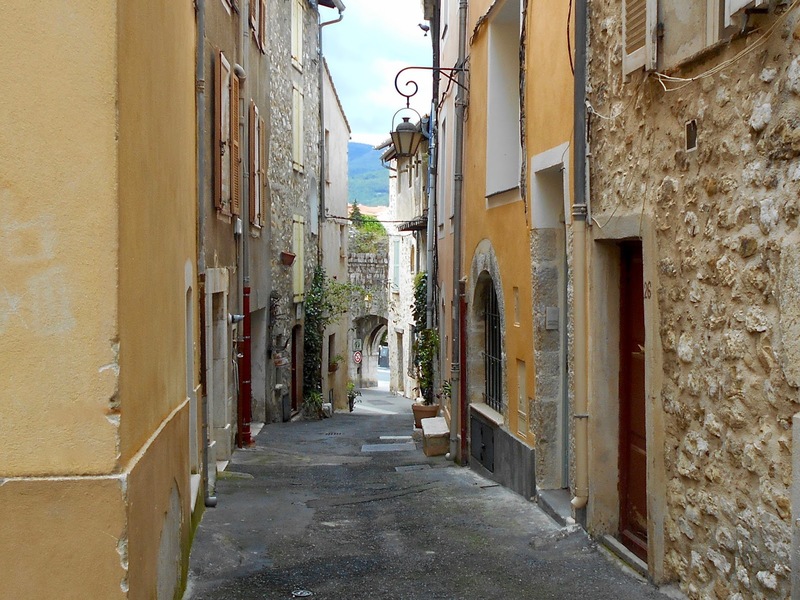 Life is that much quieter and far less hectic when it does not include vehicles. 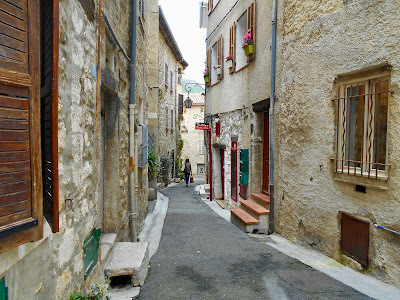 Most of the medieval villages we've explored are situated high atop hills and on the lower, outer perimeter are narrow streets that do accommodate vehicles. The views are spectacular, forcing drivers to keep their eyes on the road. 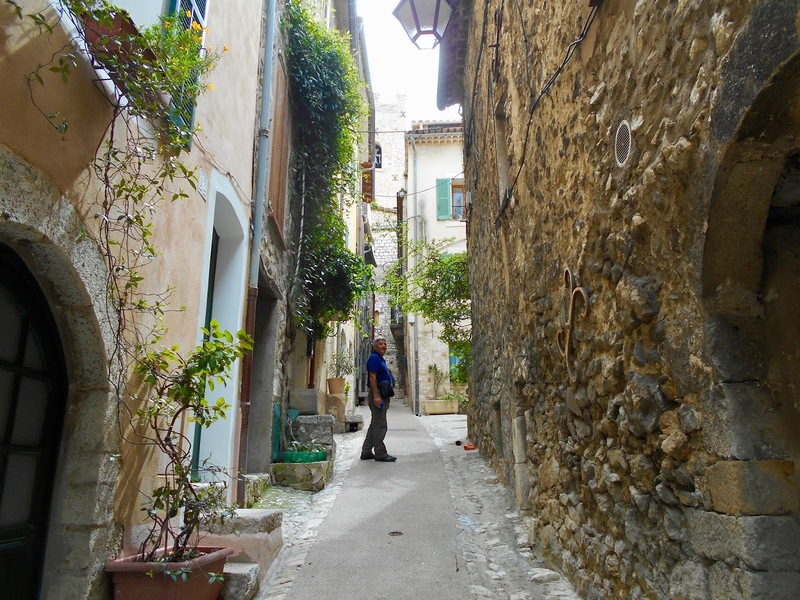 That's another perk of being a pedestrian - we have no such restrictions. 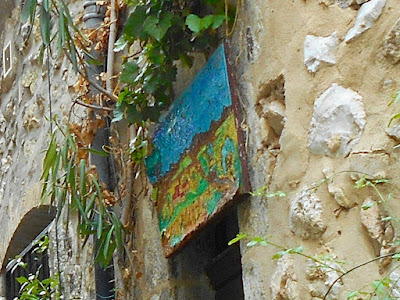 Returning to another passageway in the old town we stop to admire the kaleidoscope of colour. 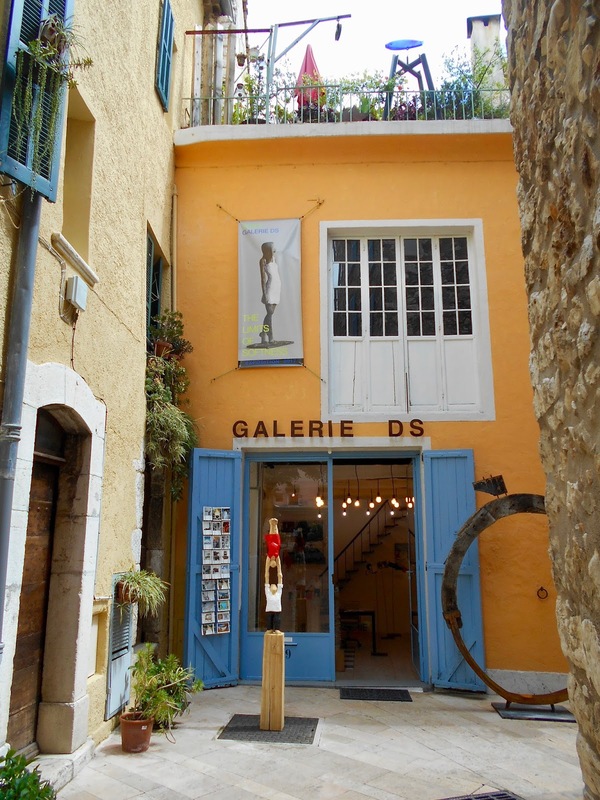 This particular art gallery caught John's attention. 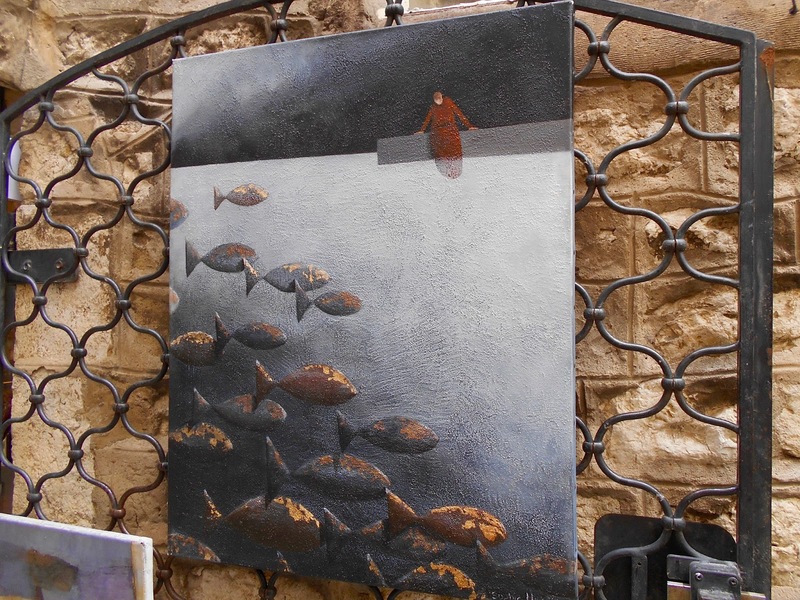 Or to be more precise this painting did. 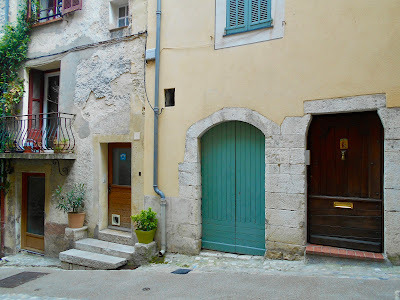 Moving onward I hit the jackpot when I spotted these five doors. When it comes to embracing the outdoors, this homeowner has it down pat. These next few buildings are like a painting in that they combine metal, wood, glass and stone on the exterior and it all fits like a glove. 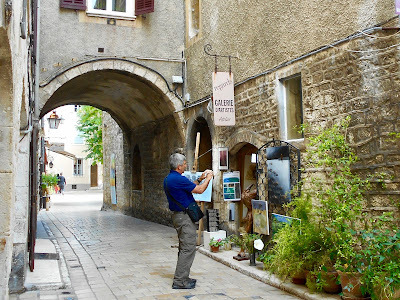 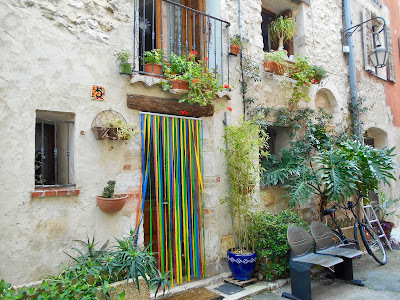 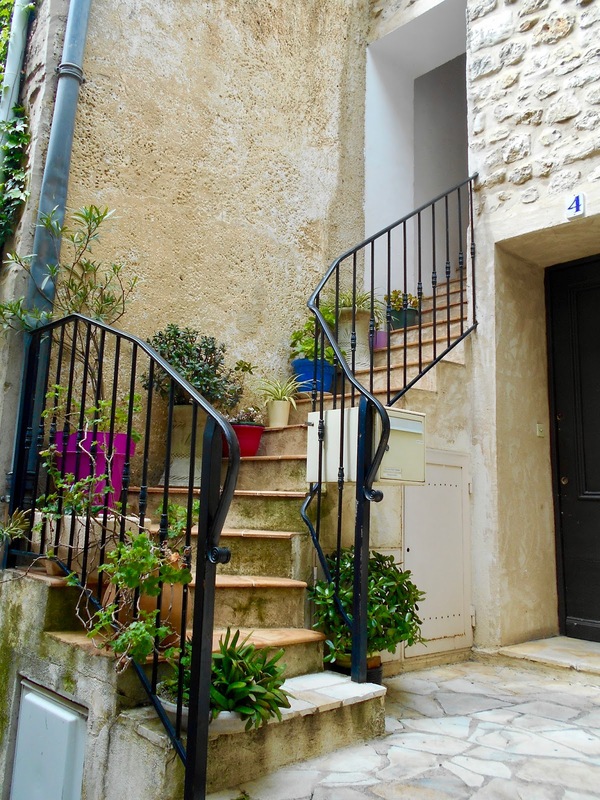 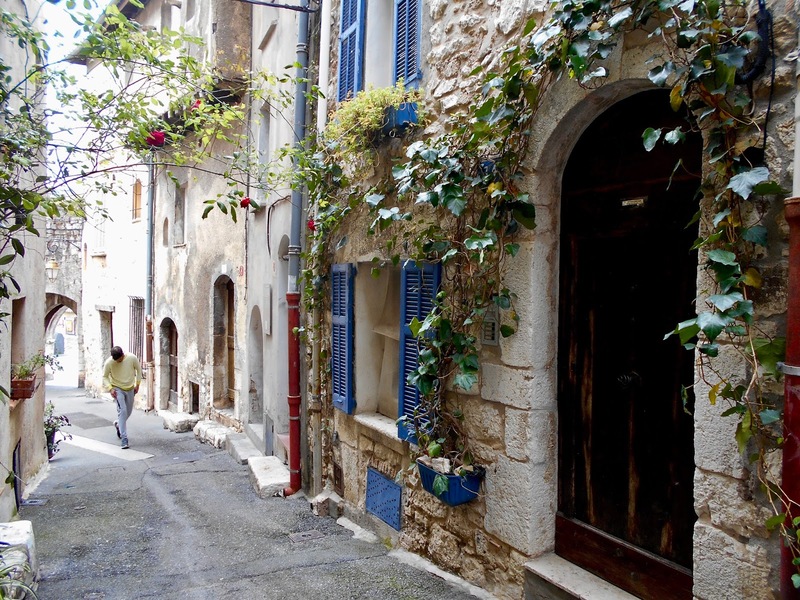 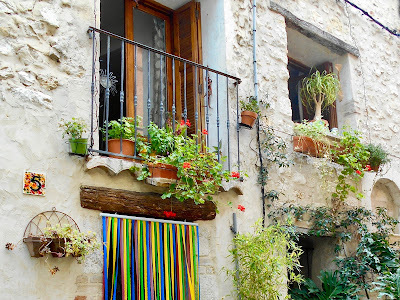 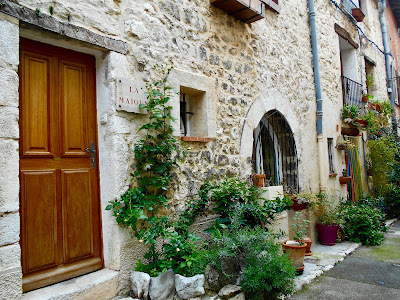 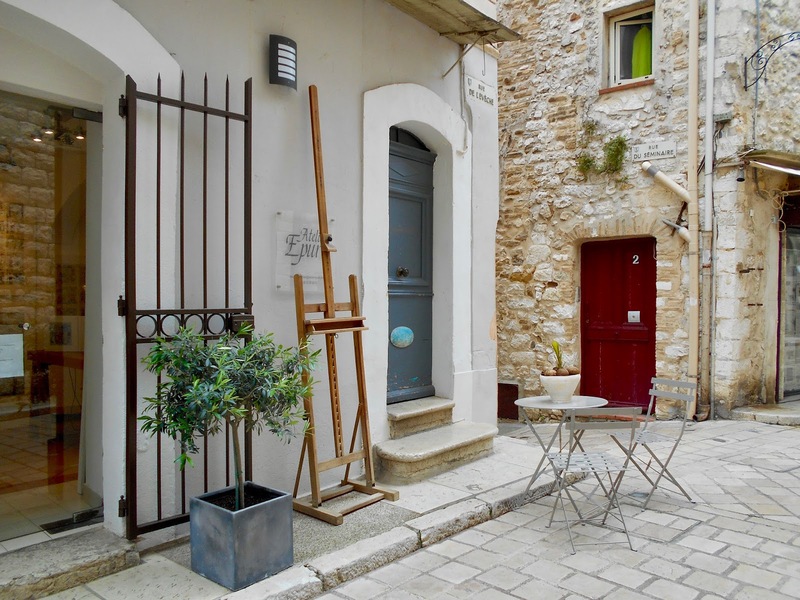 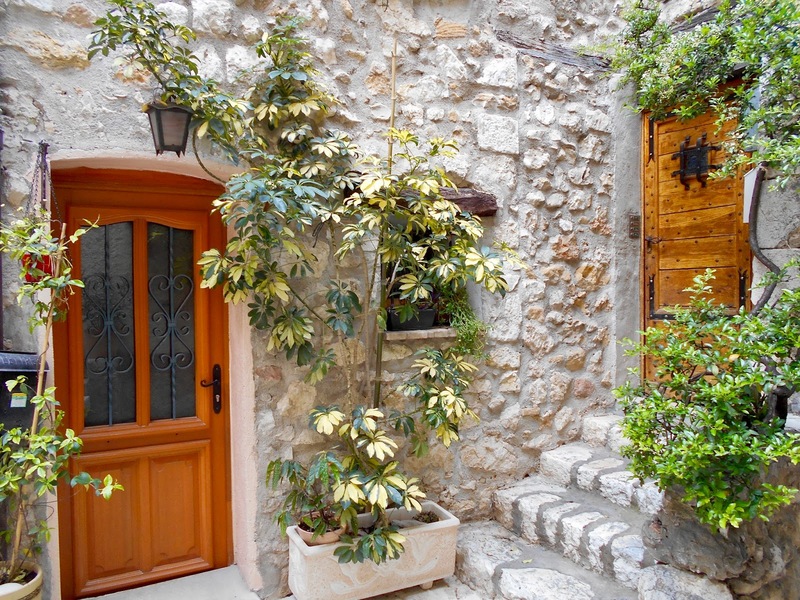 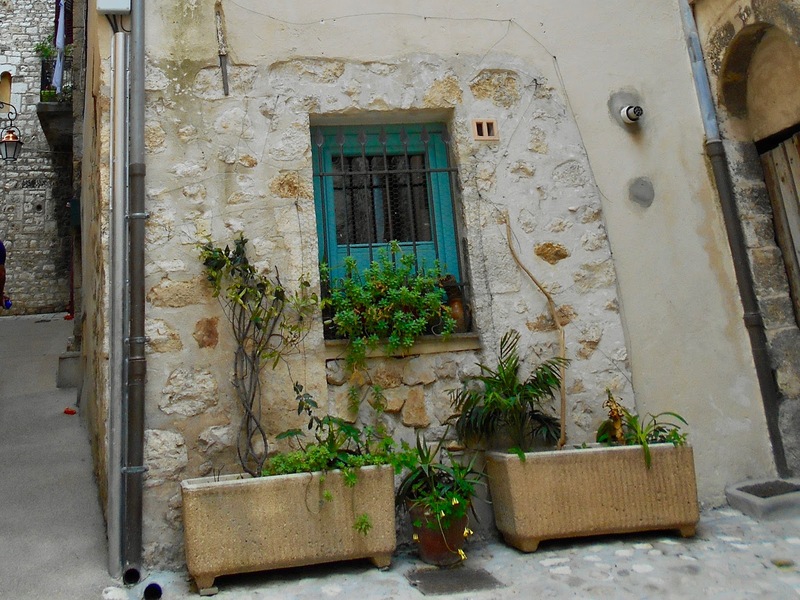 Art is part and parcel of every day life in Vence. 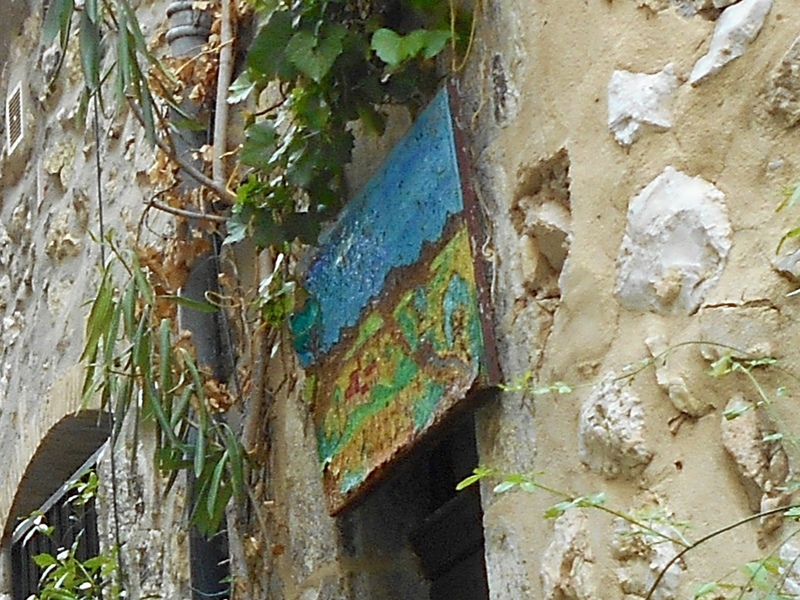 Notice the landscape painting above the doorway. 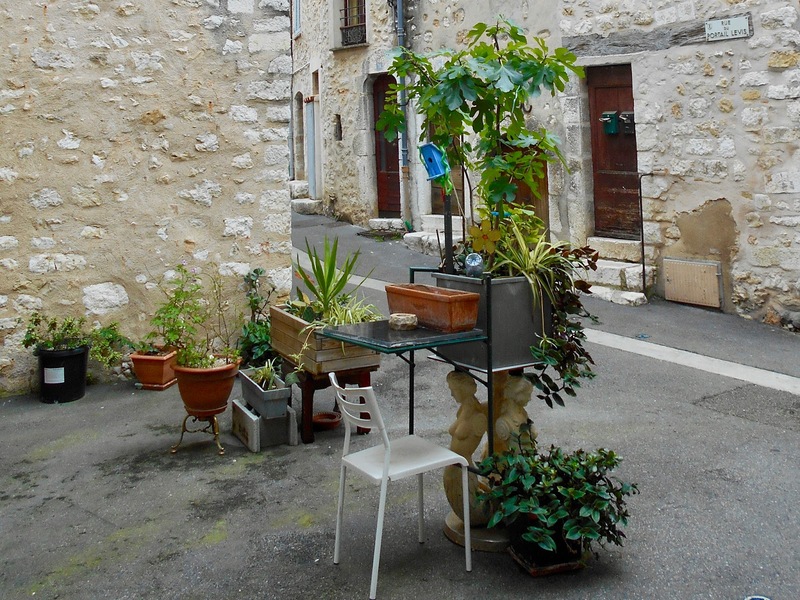 This next photo proves it's possible to not only create a unique and artistic garden feature with 'found' objects, but within a budget as well. 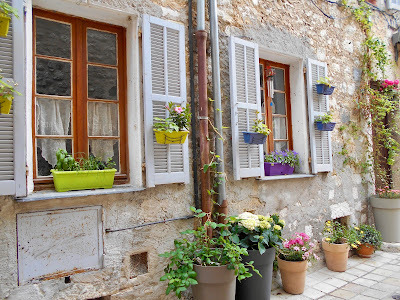 A riot of colour on drain pipes, flower pots and window timings. 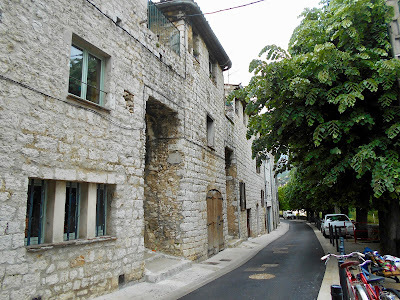 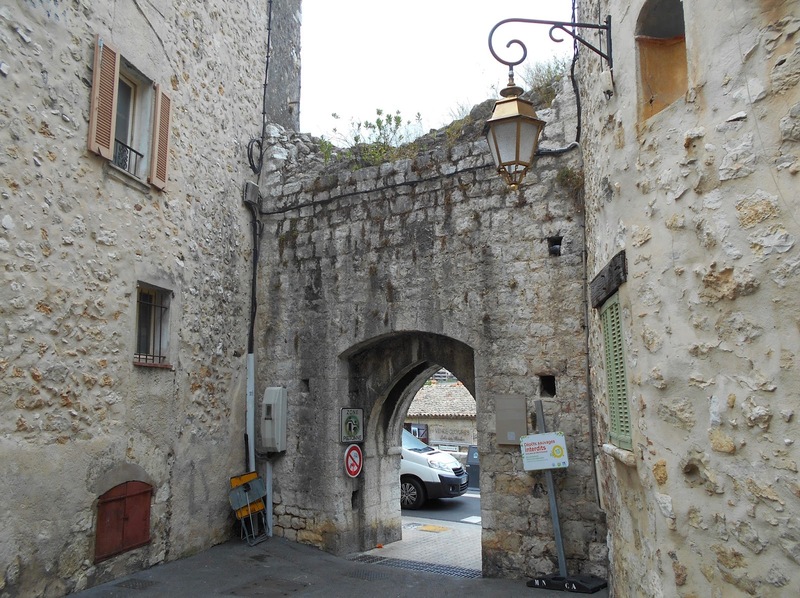 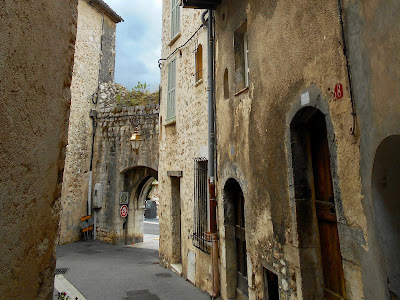 At the end of this street is the original outer wall and archway that leads to another section of 'new' Vence. 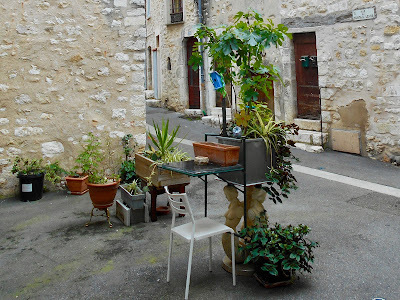 Another economical garden idea using a table and wooden crate. 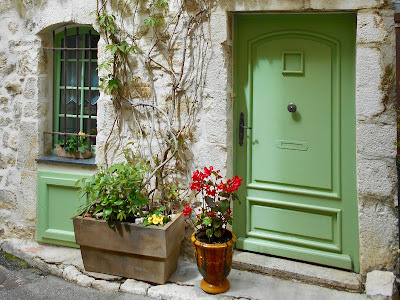 This subtle colour combination of paint, brick and stone makes me smile! 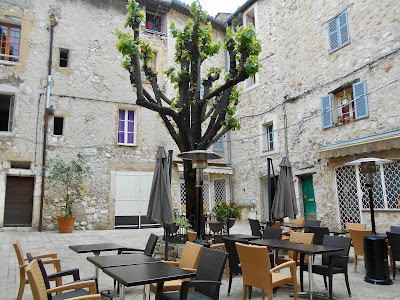 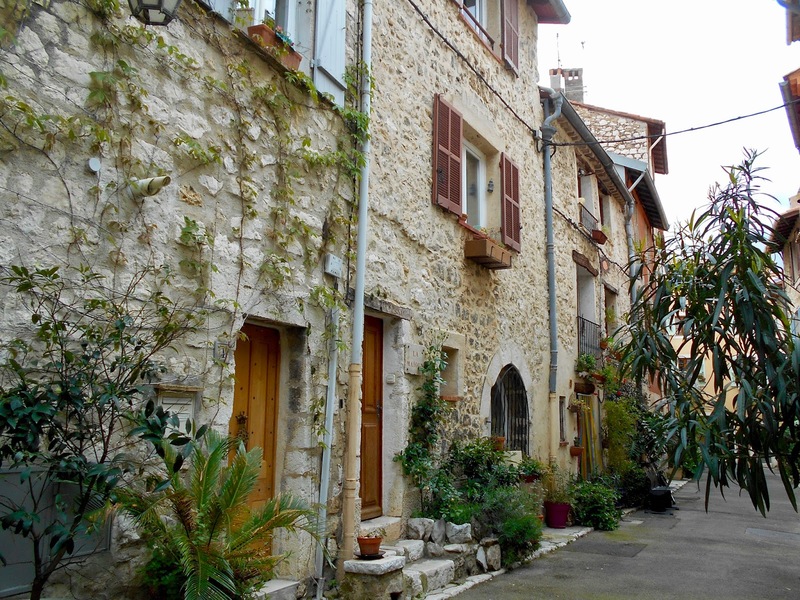 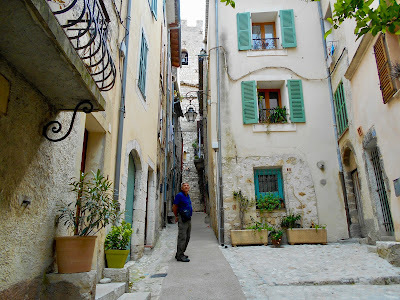 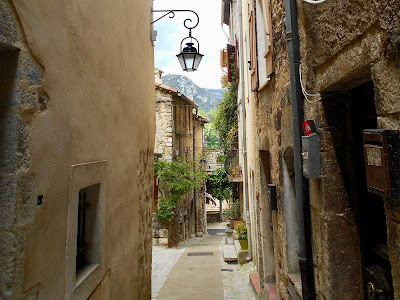 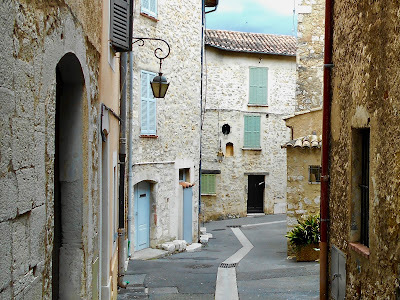 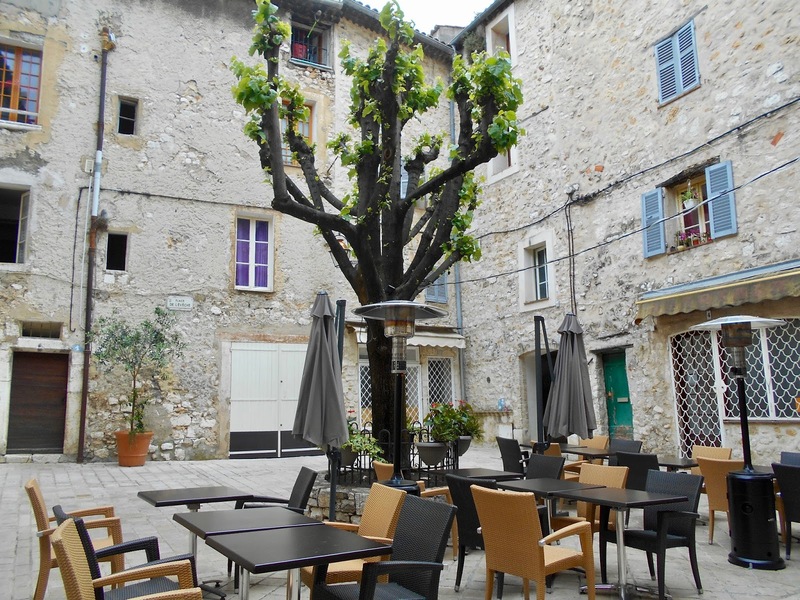 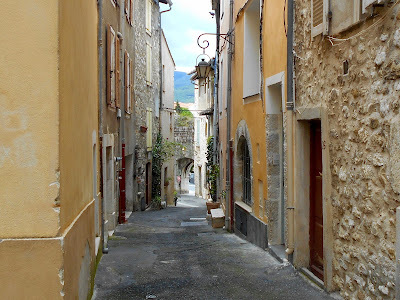 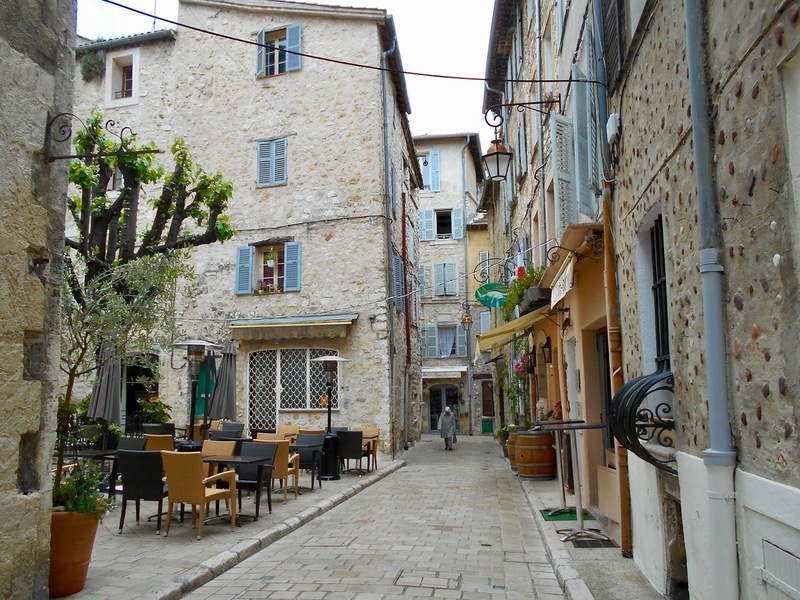 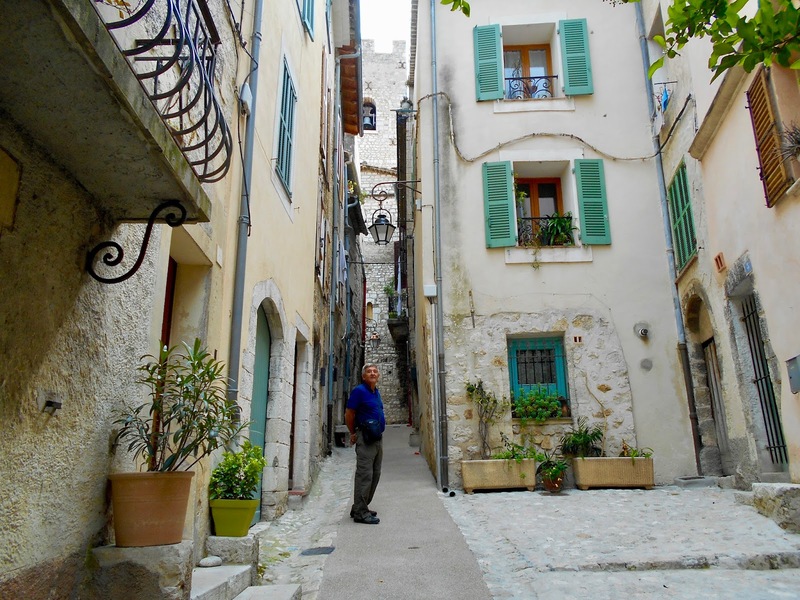 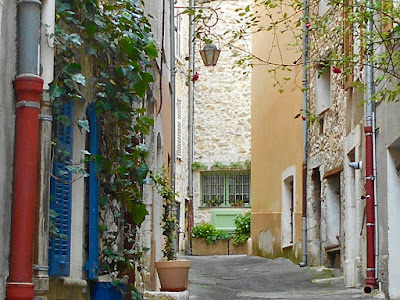 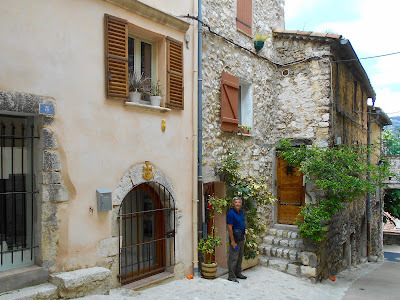 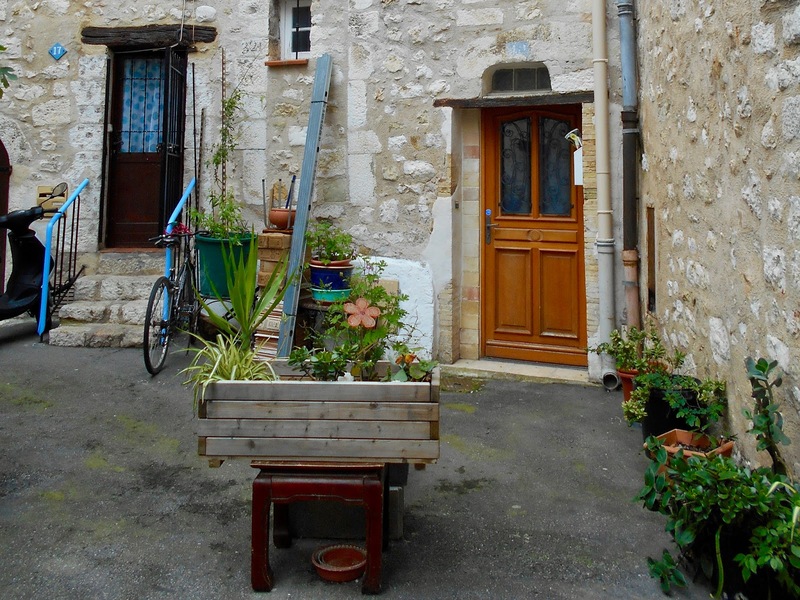 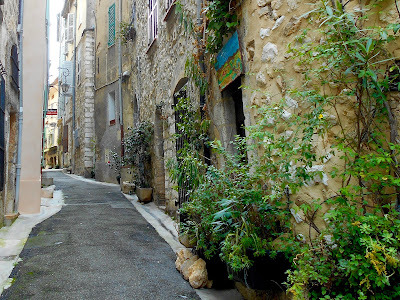 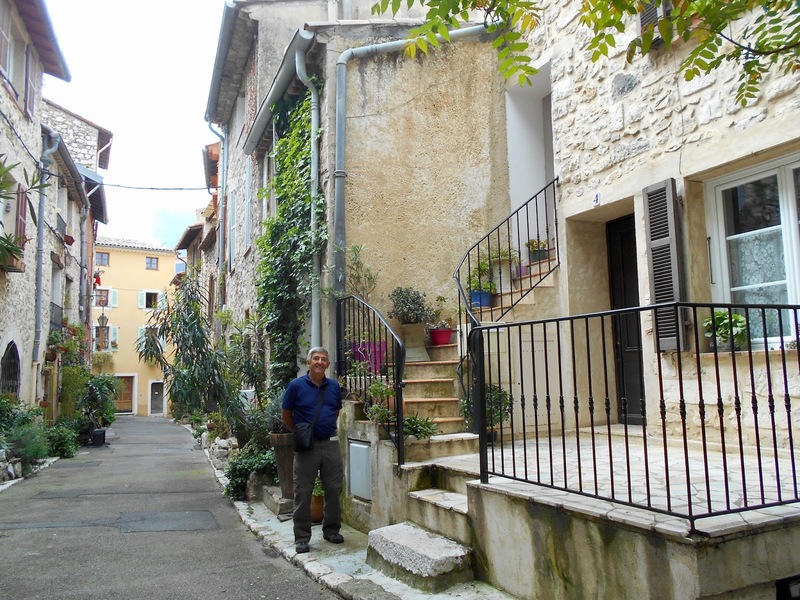 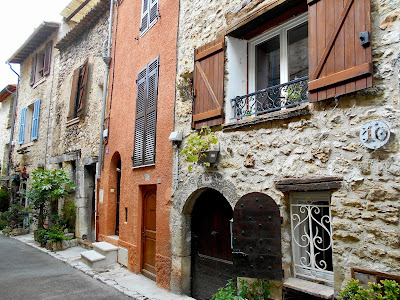 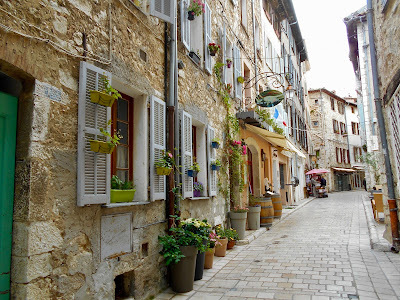 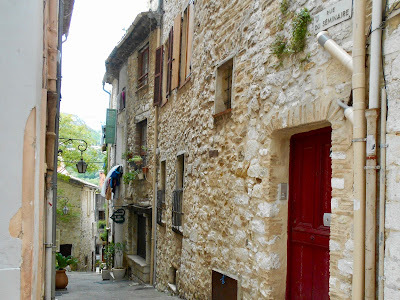 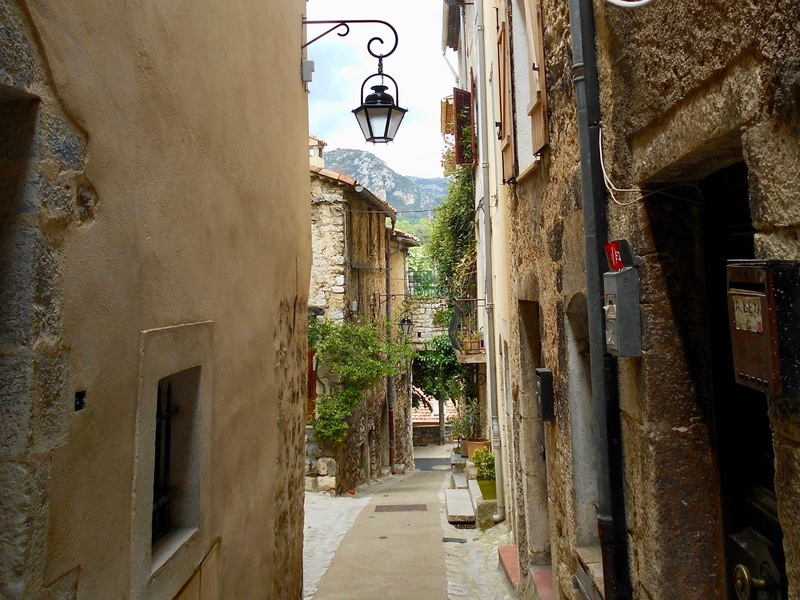 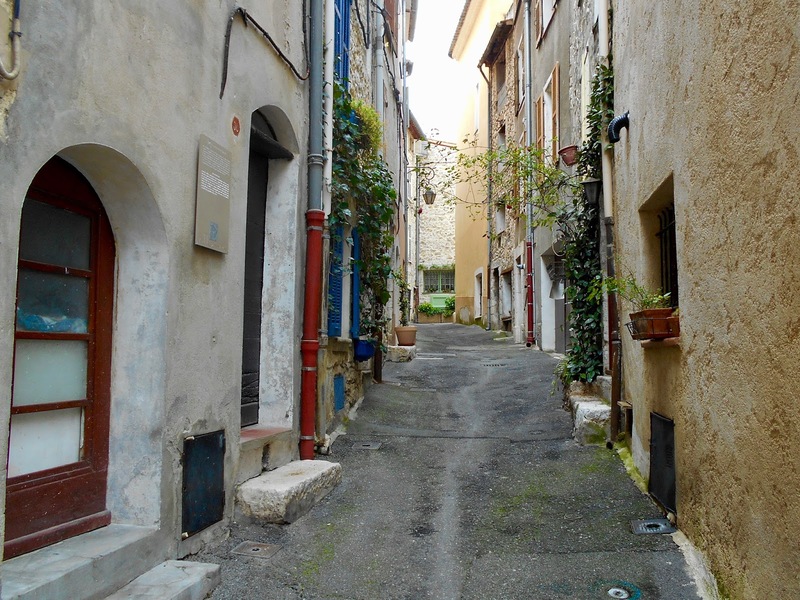 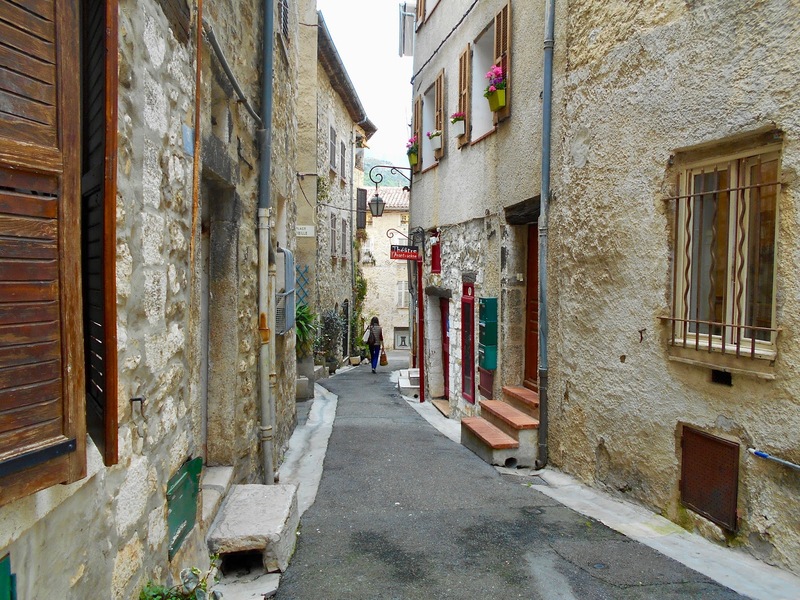 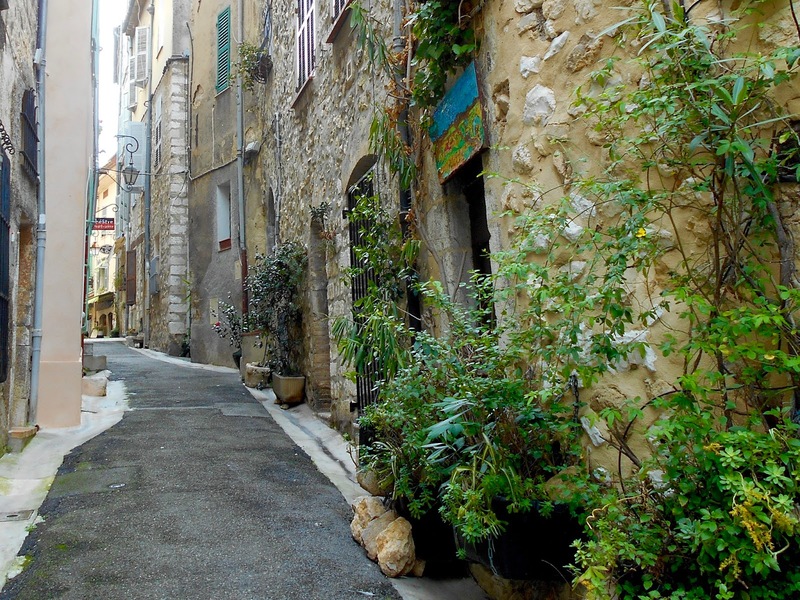 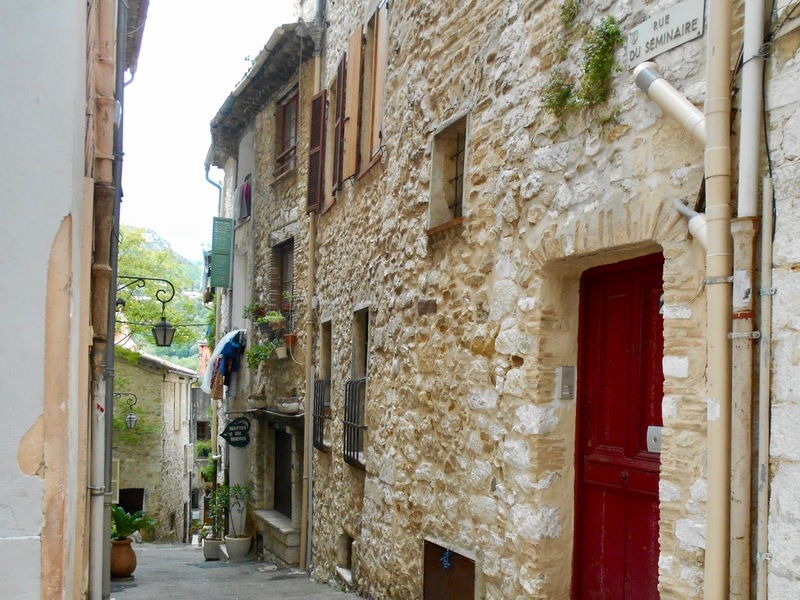 I can't help but be curious and slightly envious of those who call Vence their home. 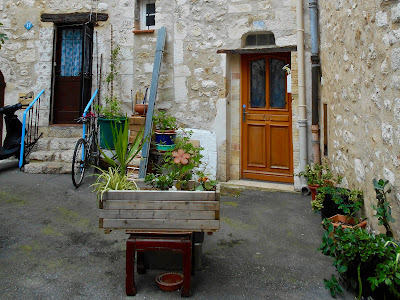 The young woman (below) passed by, carrying a few grocery items and seemingly unaware of our fascination with her. Meanwhile, the young man in this next photo seems lost in thought. 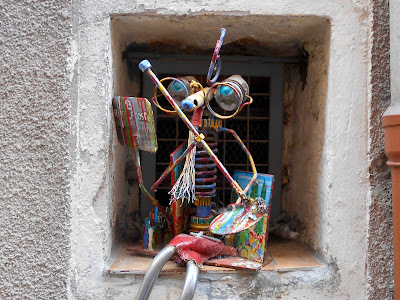 Whom could he be thinking of? This next stretch of street is about as picture perfect as it can get. Flower pots of all shapes, colours and materials adorn the exterior of this home. 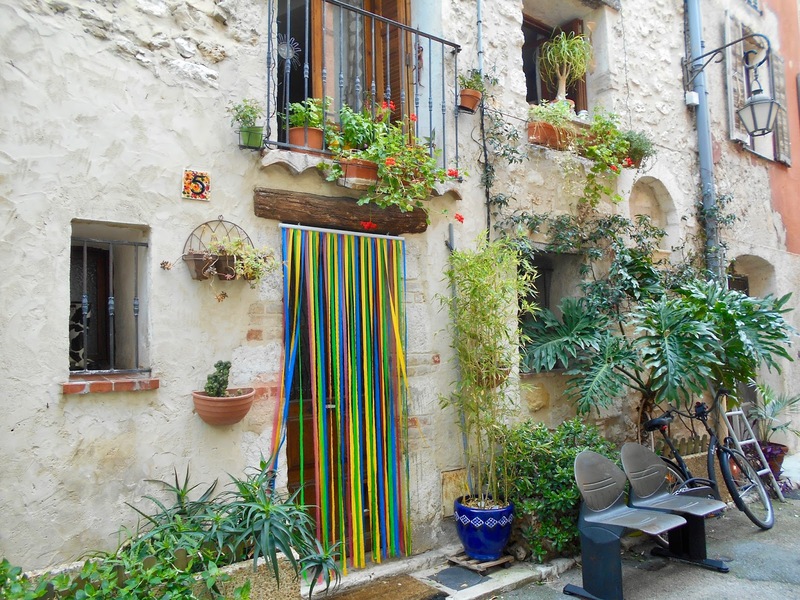 Almost directly opposite is this courtyard. I stood in awe as an old woman slowly made her way to wherever it was she was headed. A few feet from where I was standing is this art gallery with a table and chairs for patrons. 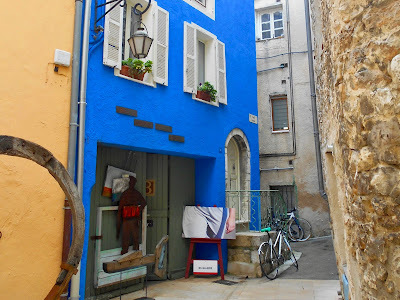 The brilliant blue of another art gallery is hard to miss! 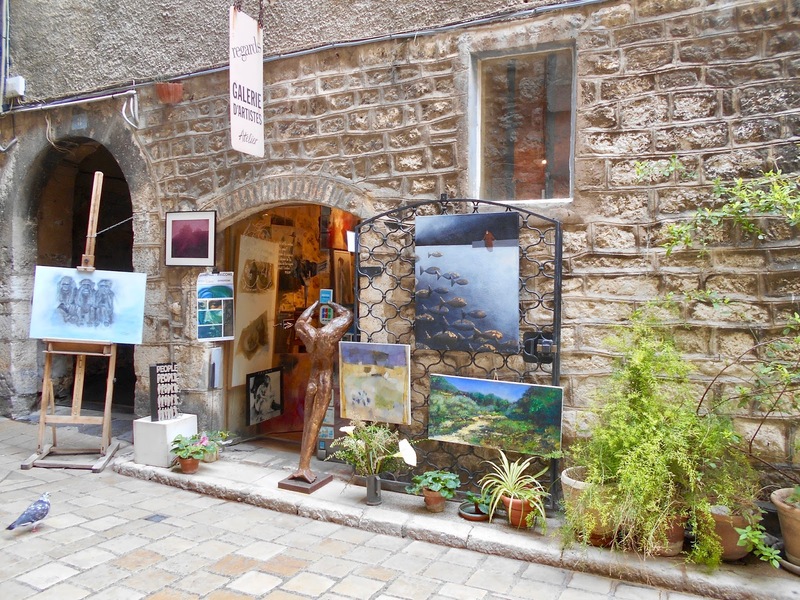 To the left is another gallery. 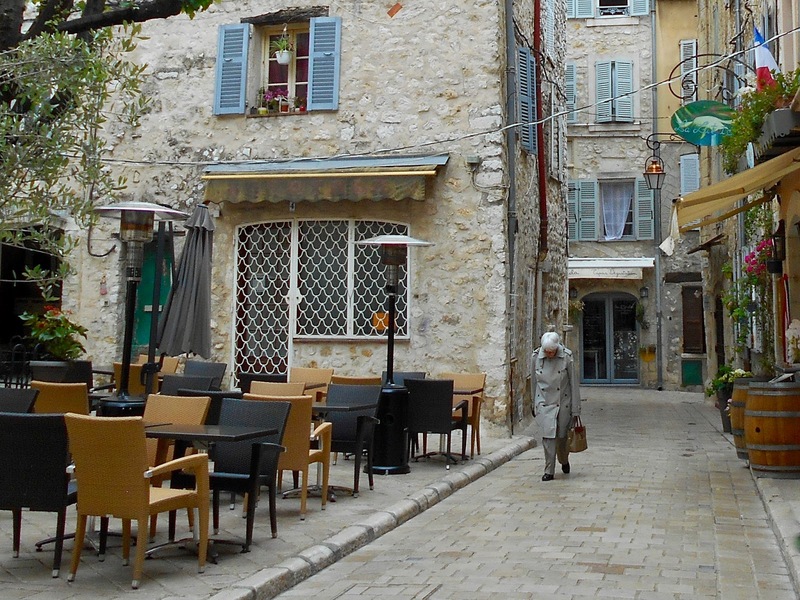 Fortunately, La Table de Domi is positioned close by and a great place to have lunch...which we did with gusto. 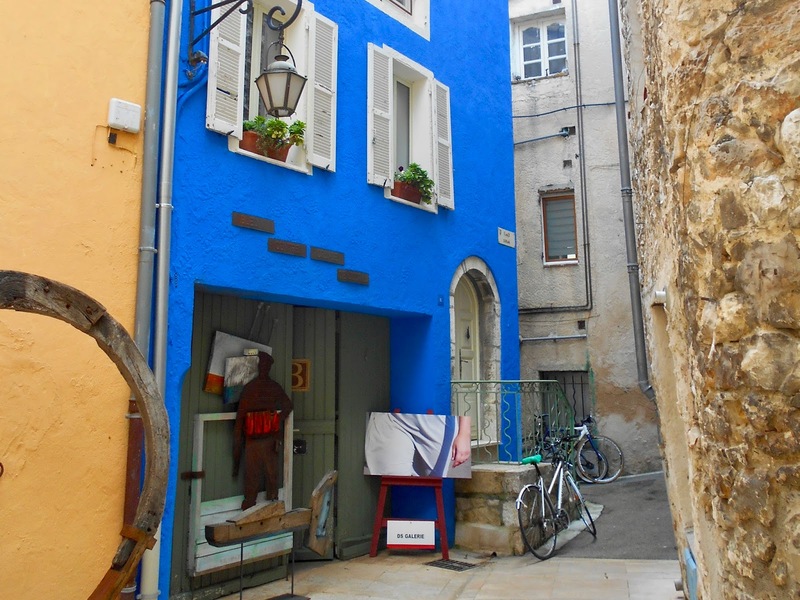 It was such a delightful and delicious way to end our visit to Vence. 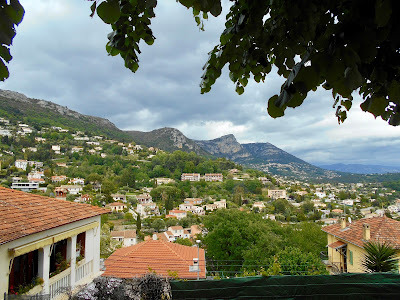 For details about La Table de Domi and other restaurants we visited while in Portugal, Spain and France check out Food, Glorious Food.